What comes to your mind when you think of fall? For me, fall brings images of vibrantly colored leaves, abundant harvests, and scenes of warmth and coziness. The opulent colors and forms found in nature at this time of year are a great inspiration for the fall wedding flower arrangements that I create. 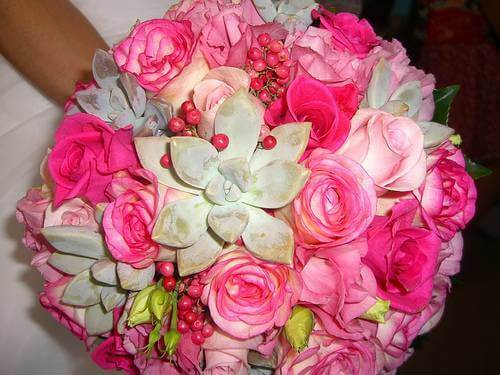 Out of all of the floral designing that I have done, the fall wedding flower arrangements are the most memorable. For the fall wedding, flowers in season may not be what you were thinking of, but there are many ways to incorporate fall themes into your autumn wedding. One great way to incorporate fall into your special day is by using autumn blooming flowers. At first you may not think that there are many fall blooming flowers to choose from, but I assure you that is not the case. 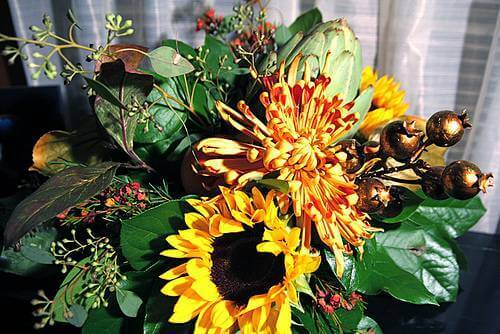 Some fall wedding flowers in season include sunflowers, chrysanthemums, and hydrangeas. Sunflowers come in miniature and large sizes, and come in colors of cream, yellow, orange, maroon, and crimson. Chrysanthemums come in almost every color of the rainbow except for blue. Hydrangeas give a lot of bang for your buck as they are large enough to take the place of several smaller flowers, and they can be dyed any color. Set your wedding apart from others by using more unusual fall bloomers such as cockscomb, yarrow, celosia, and zinnias interspersed with traditional flowers. As an added bonus, using flowers in season is a great way to save money! Maybe you have your heart set on a flower that is not a traditional fall flower, but you want to have a fall theme. No problem! Most popular wedding flowers are available in some kind of fall color. For instance, roses come in apricots, oranges, creams, and deep reds that are ideal for fall. My favorite flower, the calla lily, comes in the traditional ivory but also in orange flame and eggplant, representing fall perfectly. Also, miniature calla lilies make great boutonnieres. The trend this year is to mix a variety of flower types-why not mix some of the traditional flowers with the more unusual and make your fall wedding flower arrangements stand out? One of the biggest reasons that I enjoy doing the flowers for fall weddings so much is because I get the chance to add twigs, seed pods, berries, succulents, and gourds to the arrangements. I love the differing textures and forms of these natural treasures. 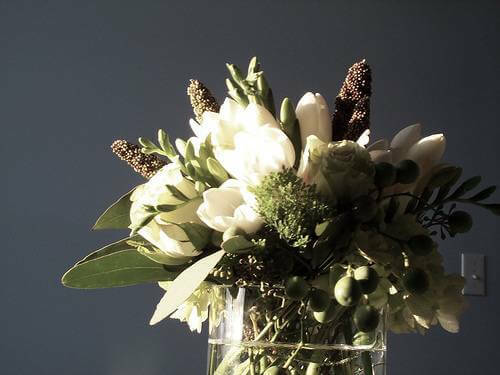 They give arrangements and bouquets seasonal interest and an element of surprise. Most of you have probably seen floral centerpieces placed in hollowed out orange pumpkins and bouquets with colorful fall leaves, seed pods and berries. A twist this year has been using gray or white pumpkins-gray especially is a hot color this year-instead of orange. Using gray and white pumpkins allows you to go with the fall theme without using the traditional fall colors. Pumpkins can also be painted in any color, even silver and gold, allowing whatever color scheme you dream of while still providing the elements of fall wedding flower arrangements. The use of succulents such as hens-and- chicks and sedums add surprising textures and a variety of subdued colors that work well with any color scheme. They can also be used to make stunning planted gifts for your wedding guests. As you can see, using fall flowers for weddings is just one way to give your wedding an autumn theme. Color and texture are also powerful factors in setting the atmosphere for your wedding. You can have a fall themed wedding with spring colors or summer flowers if you think outside of the box. I hope that you find these tips useful and that you have a fabulous fall wedding!